What are the best places to visit in Cambodia with kids? Or where to stay in Cambodia with kids? We have travelled through quite a list of destinations in this Kingdom of Wonders and you can read about our travels here. 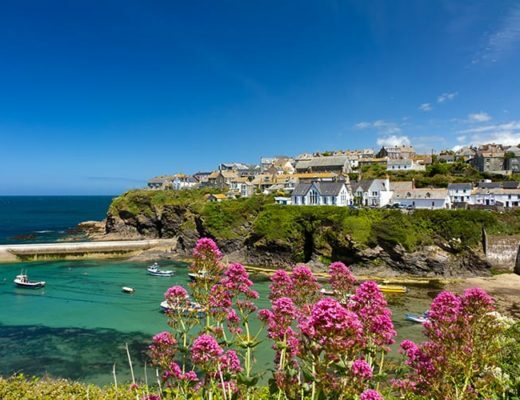 This amazing country has so much to offer, from ancient temples to relaxation on the beautiful and white sandy beaches. You will have it all here. We loved it! In today's post we will let you know where we stayed and what are our affordable accommodation options for Cambodia with kids. You do not need a pen and paper here. Simply follow our links and you can check out the best prices and what suits you best. Siem Reap has stolen my heart somewhat. The city itself has quite a rough feel to it, but it’s awesome. Streets smell of dust as people rush through them on scooters, bikes and Tuk Tuks. Everywhere you look there is food. Restaurants surround you and entice you to come in. Angkor Wat peacefully located just outside the city, awaits your visit for centuries. You are in the middle of it all, the heart of Cambodia! Needless to say, when we came to Cambodia, one of the main things that we wanted to see was the Angkor Wat Temples. We wanted to stay in close proximity to famous temples and that is why we were looking for the best place to stay in Siem Reap with kids. And we found one! Our choice was simple. Navutu Dreams Resort and Spa! There was simply nothing like this place that suited our criteria to a tee. Beautiful villa with separate rooms for us and the kids. Comfy beds, largest bath tub and shower, and room service with a smile. We were very happy here lazying around the three pools sipping on virgin cocktails as Katie-Lee and Lily played in and out of water in front of us. 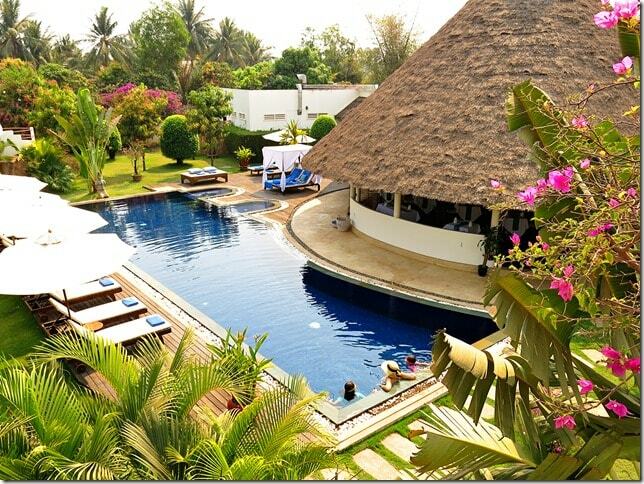 Peaceful oasis and the best hotel to stay in Siem Reap! The choice between 3 different types of swimming pools! Phnom Penh. The Capital of the Kingdom of Wonders, Cambodia! The concrete jungle with history coming out of its pores. If you are after learning about the country and its recent century, you came to the right place. Here you will find museums and the home of the king. Here you will loose yourself amongst millions of rushing motorcycles and cars constantly weaving in and out of traffic. Here you will find the heart of once thriving port and the majestic Mekong River. And what better way to see the city, then from your Sunset boat cruise. 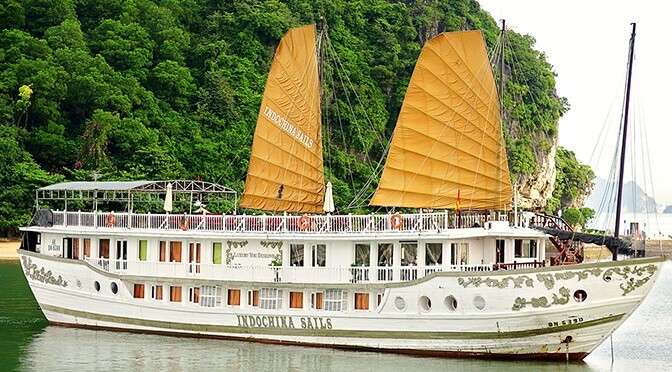 Check out our Phnom Penh Cruise here. When you are looking for affordable accommodation in Phnom Penh with kids it is only wise to position yourself near the centre of the city and close enough to the river as possible. That way you will not be too much out of pocket for the transportation to and from the action and all the restaurants of the main drag. If your Phnom Penh accommodation is far away from the centre, you will spend a lot of time zig-zagging the streets in peak hour traffic. We have chosen to stay at the Tea House Asian Urban Resort. As you can see by the price, we decided to save couple of pennies in the capital and go for a cheap hotel in Phnom Penh. Although the place was comfortable, the food at the restaurant was great and the service was brilliant, there was something missing. This hotel is only a few minutes Tuk Tuk ride away from the river, but it is stuck in the middle of the high rise city. The only window we had in the room faced another wall, but what can you expect from a cheap hotel. Nonetheless, the room was very tidy with modern decor and had everything we needed for the stay. I would class it as a cheap boutique hotel would recommend a stay here if you are after an affordable option. Kep was more then I expected. This place just screams relaxation and an indulgence in the local cuisine. Kep beach was lined with hammocks and chairs. As far as the eyes could see, small gatherings of people chillaxing with drinks and variety of food. Families, couples, tourists or not, everyone with smiles on their faces. The crab markets are full of life, fresh crabs picked out of the sea and straight into the open kitchens. The smell is amazing, the atmosphere engaging and my mouth salivating! 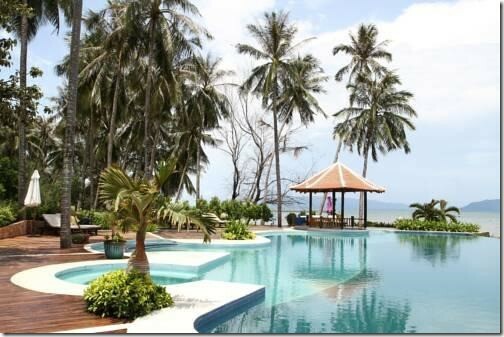 Where to stay in Kep with kids? There are plenty of choices. Whether you stay close to the Kep beach or closer to the crab markets, you are only a few minute Tuk Tuk ride away. 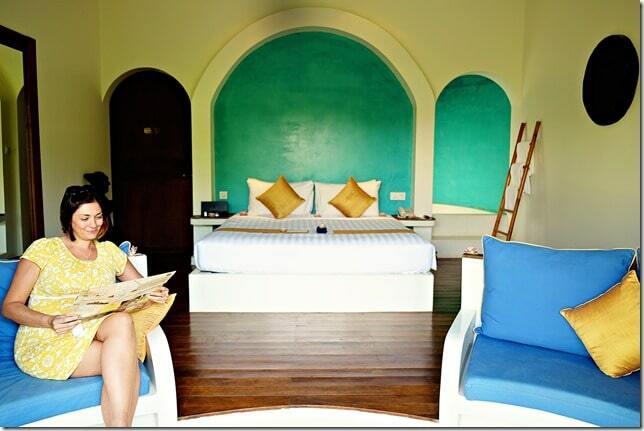 Let me help you with choosing your accommodation in Kep. Raingsey Bungalow Kep was our pick for the stay. 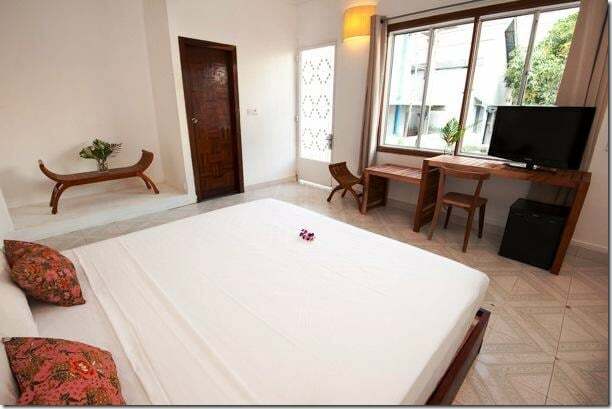 Located just a few minute walk from the famous Crab Market and the Kep National Park. The bungalow we had, suited our family perfectly. Comfortable beds with separate rooms for us and kids. Air con and all at a very affordable price. Chilling out by the pool watching our kids play is always nice. Here was no different and more. Buffet breakfast on the top level of the reception was just perfect. Great food, nice views, pleasant and helpful staff; Raingsey Bungalow Kep has got it all! Kampot Cambodia, a small town by the river with the views of the Elephant Mountains and about 5km from the Gulf of Thailand. Have you ever seen fireflies and bioluminescent plankton? Interested? I know we were. How about a private after sunset cruise on a river. Here you can loose yourself into a dream-like state. I think we all were mesmerized by the little sparkling flying fireflies. It was pretty cool! When we were looking for Kampot accommodation, we struggled a little to find something suitable for a family. This is a capitol of the province, however it is still a small town in many ways. 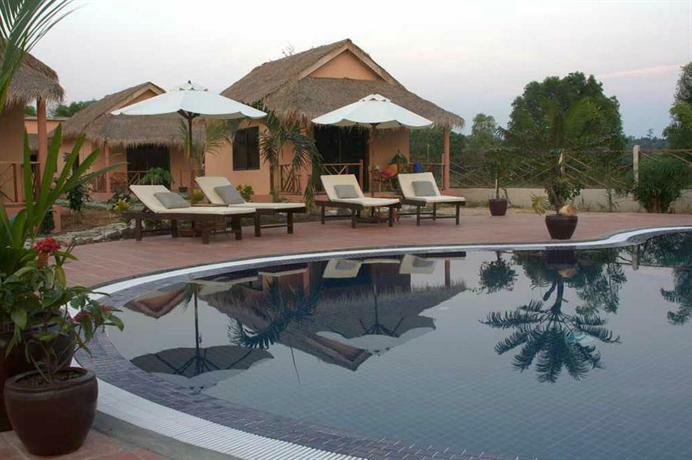 Although there are plenty of places to stay in Kampot, this is a resort that we would recommend for you to stay at. 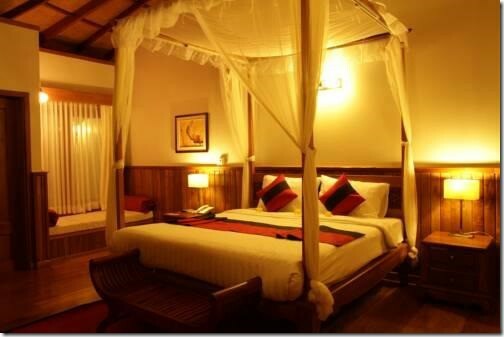 Nataya Resort or Nataya Round House Coral Bay Resort is probably the most luxurious resort in Kampot. All the bells and whistles ticked off here; including private beach, mineral bath and a Jacuzzi. All the rooms are comfy, modern and stylish. You can indulge in the Halal inspired cuisine served on the terrace. Say no more, little bit fancy here! Your little ones will have plenty to do, jumping in and out of the pool, or hopping onto the beach and playing in the sand till the heart's content. Otres Beach has definitely left a mark in my mind and in a positive way. The place is pretty much designed for a bit of a fun time whilst in Cambodia. I named this place an Amsterdam of Cambodia and I think that you can figure out why. You can get a closer look at our experience at Otres Beach here. When you are looking for family friendly Otres Beach Accommodation, you will be faced with a few options. To me the choice here was easy. Do we want to be in the noisy area and party all night long or do you want to stay in a hotel a little bit away from all the action. Choice is yours. However, here is our recommendation to make your life easier. The Secret Garden at Otres Beach is located in a more quiet part of town. I think this is a much better place to stay with kids. Here, at this Otres 2 accommodation option, you can relax at your private stretch of beach or by the pool, whilst enjoying a nice freshly made cocktail or two. Your kids, if you are bringing them on your holiday, can play in the kids pool as well. And Otres 1 is only a short walk away. Ah, Koh Rong Samloem, this is the place to totally unwind and refresh your brain. Here at the famous Saracen Bay or at the Lazy Beach, you can spend some blissful time, whilst on your private hammock that is stretched in between two poles in the shallow waters of the Bay. Sounds enticing, I know it does! You can check out some of our awesome pics and our story about this amazing island here. Once you are on the island all you will want to do it to lazy around on one of the hammocks and forget about the world behind you. Imagine it to be your private oasis and it will be so. Saracen Bay beach stretches as far as the eye can see, with plenty of choices of cuisine and so much more. 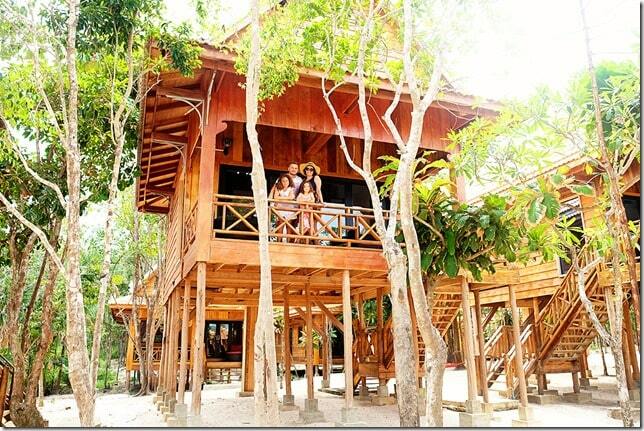 Here is our family friendly option for your Koh Rong Samloem accommodation. 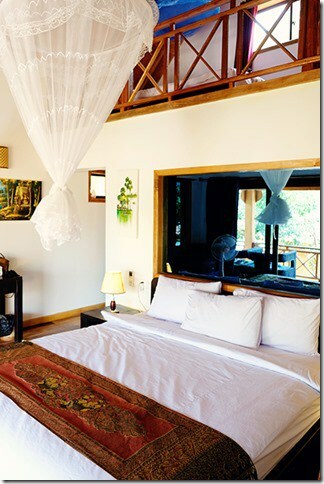 Our choice for the best accommodation on Koh Rong Samloem is without a doubt Sol Beach Resort on the Saracen Bay beach. We had the most relaxing stay at the Sol Beach Resort! On our stay we chose the Villa Double Room. Up the stairs and with a view onto the bay, whilst nestled in between trees, this was the most awesome way to live when on the island. We loved it! Our kids where in seventh heaven when they realized they had the loft all to themselves. Awesome restaurant, great service, large beach frontage, hammocks everywhere. Yup, Loved it! Whether you are searching for where to stay in Cambodia or best places to visit in Cambodia, there will be a magnitude of choices. 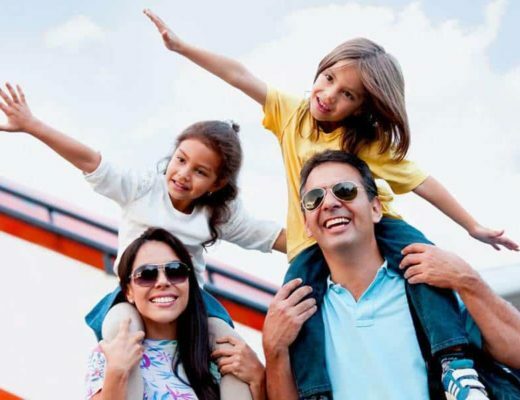 We have spend countless hours searching for the perfect resorts and hotels to suit our family of four and I hope that you will find those on our list to your liking. These are some of our favourite places to stay for Cambodia with kids and I know that they will be yours too. 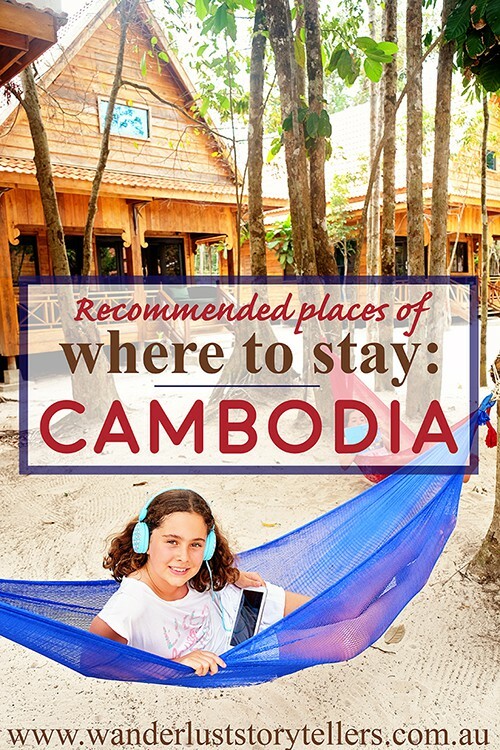 Which place from our list will you put on your list of where to stay in Cambodia with Kids? Hey, I think Nataya Round House Coral Bay Resort is the best among them. Recently I and my wife stayed there for 5 days. It was really a great resort for visitors though the whole Kampot is a beautiful place.